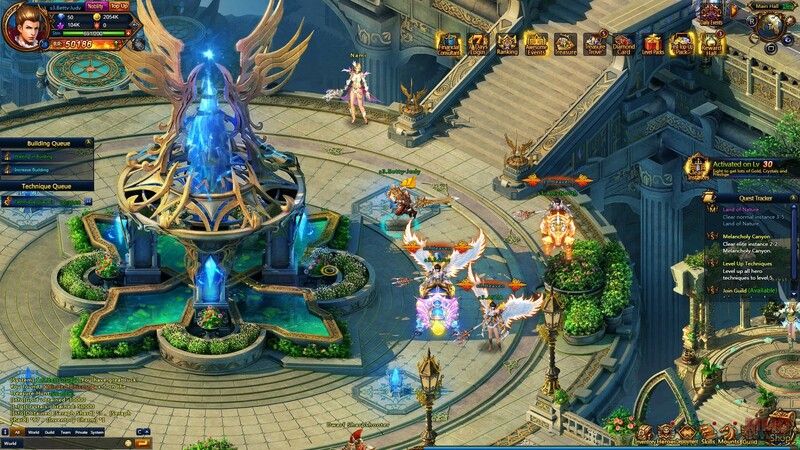 A hero building strategy RPG, God Wars allows players to be the champion of a realm under threat, summoned by the benevolent Gods that you serve you have been given the great task of destroying the demon invaders from the Abyss. The game is free to play with subscription/VIP charging options allowing players to acquire premium Diamond currency to be used in various features, along with VIP level perks for further rewards. God Wars does not require any type of client download to play and can be accessed through internet browsers. At its core God Wars is about players trying to build up the most powerful team of Heroes that they can in order to tackle the most difficult game content, which yields rewards and allows them to further improve their Heroes and team. End-game PVP with rank based achievements and rewards are a main focus for higher level players, battling against each other for pride and prizes. Each Hero has a basic BR score determined by the cumulative effects of their level, gear, upgrades and more; each Hero in a player’s active team contributes their BR score to an overall team BR to show just how powerful the player is. Starting with the player’s initial character, either warrior or mage, each Hero in the game has a particular role that determines a particular play style and how they should be used as part of team, ranging from a Guardian dressed in heavy armor and shield able to absorb enemy damage, a Priestess who can heal her entire team, a Dwarven Sharpshooter who takes critical shots from long range, and many more. With multiple Heroes players are able to place them within a formation using the Deployment option, opening up a three by three grid made up of a front, mid and rear line to place Heroes on and divided into three columns. Enemies typically attack the opponent directly in front of them, and so placing well defended Heroes in front of low-defense Heroes (such as mages and healers) provides them a lot more protection. Similarly certain Heroes may attack an entire column in front of them, so depending upon which column they themselves are in will determine the focus of their attack. Where Heroes are placed in the formation, and the synergy between different Hero choices, all depends upon the players own personal strategy and their style of play, offering a lot of customization when having a battle. Battles are instanced based encounters against the AI or even players, most commonly it is through the various PVE features such as the main campaign quest stages. When combat is initiated the player’s Heroes and the enemy opponents all begin fighting in turn, with automated attacks targeting whoever (or more accurately whichever square) the individual Hero is programmed to. Players can control the attacks of their own character; though still do not get to choose who they target, with a range of abilities that accumulate and spend Rage. As a key resource for attacks players must balance out using weaker abilities that generate a specific amount of Rage upon use, to using stronger attacks and abilities that drain the Rage pool. Players will naturally progress through the game earning XP as they defeat various encounters and complete content, which in turn will level them up and make them more powerful and unlock new features and content. Each Hero can also be individually levelled up, which they will need to be in order to compete against the AI and PVP enemies they will face as they advance; with various systems and mechanics in place to level up, train and equip Heroes players will need to acquire a wealth of resources and materials in order to improve their Heroes and make their team stronger.